Kimberly and Priscilla Addison hand-sort their sun-dried cocoa beans before roasting them inside their mom’s oven at their home in Accra, Ghana. After roasting, the sisters transform the beans into chocolate bars. They’re labeled ’57 Chocolate’ and packaged for sale. Kim said she can work without temptation, but her sister Priscilla fights hard to resist eating their chocolate. “You can’t eat everything in the factory otherwise you’d be out of business!” she laughed. The Addison sisters are chocolate makers. ’57 Chocolate is their handmade, bean-to-bar chocolate brand. Sisters and Co-founders Kimberly and Priscilla Addison Aim to Raise the Chocolate Bar with '57 Chocolate. While living and working in Switzerland, the Ghanaian girls went on a factory tour of Swiss chocolate maker, Maison Cailler. They were looking to do ‘touristy things’ as the country is renowned for its decadent desire for chocolate. The idea to manufacture their own chocolate confections formed while learning about cocoa during the tour. Africa is the top cocoa-producing continent. According to the World Cocoa Foundation, approximately 70 percent of the world’s cocoa supply comes from West and Central Africa. The second largest cocoa producing country in the world is Ghana. The Addison sisters were disheartened to learn there’s few African-based companies making and selling chocolate from their homegrown beans. Tasting this fact was bitter. Priscilla and Kim shared this idea with their parents, who were planning to retire in Ghana. With their support, the sisters quit their jobs, cashed out their savings, and moved home. For two years, the Addison’s melted and molded their minds into the cocoa and chocolate making industry. “We had no clue, anything whatsoever about chocolate,” Kim admits. Their research took them to the Eastern region of Ghana where they hired Yayra Glover Ltd., a cocoa bean producer. His farmers remove the beans from the cocoa tree, dry, and deliver them to the Addison sisters in Accra. The beans are roasted, hand-separated, and pureed by machine into a smooth, liquid chocolate form. 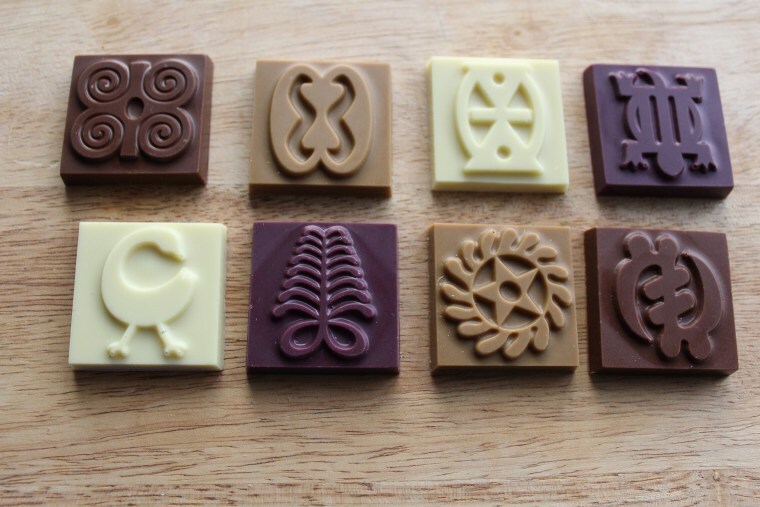 In three to five days, ’57 Chocolate is poured into ‘Adinkra’ symbol molds — each one representing a traditional Ghanaian aphorism. The bars come in dark, white, mocha, latte, bissap, and milk chocolate flavors. Some have dashes of sea salt, coconut, and almonds. As a startup, Priscilla said they’re able to easily experiment with different tastes. “I really like green tea so one day we bought some matcha green tea and we created a green tea white chocolate, which we absolutely love," she said. But the sisters faced pitfalls being a startup company in a developing country. Ghana experienced a long period of irregular, unpredictable power outages in 2016, nearly crippling the budding business. Language was another barrier in navigating business in the country. The sisters aren’t fluent in “Ga,” speaking it sparingly. “We mostly use it to make people laugh," Priscilla confessed. Their ‘can do’ spirit they said, drives their aspiration to stay in the chocolate-making industry for the long haul. Through word-of-mouth and social media, the sisters said sales are steady. Priscilla is exploring international shipping options, ensuring the chocolate morsels won’t melt in the mail. “We get a lot of requests to ship abroad and we are working on it," she said. ’57 Chocolate isn’t the only African-based chocolate brand. It’s part of a few. The sisters are capitalizing on Africa’s natural resources and they want blacks across the diaspora to join in. The bean to bar chocolate making process happens in the Addison kitchen in East Legon, Ghana.